Location: Europe, mainly the Isle of Wight, off the Southern English Coast. Hypsilophodon was discovered in 1849 by William Fox. 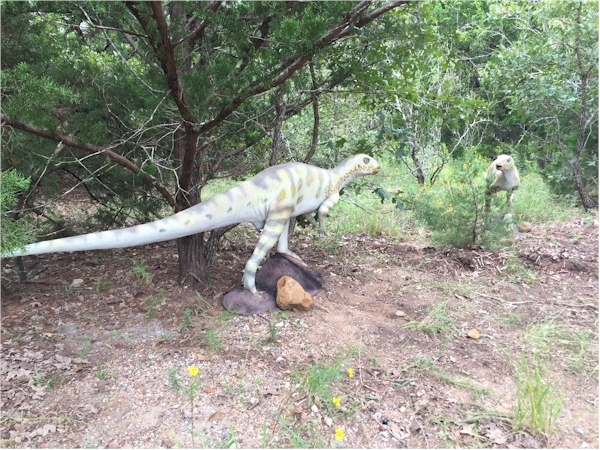 But for about 20 years, it was widely believed by paleontologists (including Sir Richard Owen himself) that Hypsilophodon was nothing more than a juvenille iguanodon. This little biped (walked on two legs) was a very fast runner with a stiffened tail that helped it balance well. Hypsilophodon had four toes and five fingers, including an opposable. They had a beak with about 30 teeth and was primarily herbivorious, mostly eating seeds like the ones from cycad plants. A bonebed of about 20 Hypsilophodon fossils were unearthed together on the Isle of Wight. This indicates that a herd of them died together, which implies they probably lived together in herds. They laid eggs and may have cared for their young for at least a little while, evidenced by eggs found carefully placed in Hypsilophodontid nests.